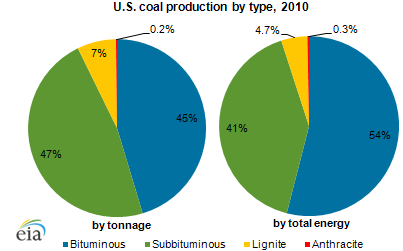 Source: U.S. Energy Information Administration, IEA Coal Information 2010. Note: Total energy estimated utilizing 2009 energy density values. While almost all coal consumed in the United States is used to generate electricity (90% in 2010), coal is not entirely homogeneous. Coal is classified into four types, distinguished by the amount of heat it produces and, for coking coal, its ability to agglomerate. While coal with higher levels of heat content, coking characteristics, and lower sulfur levels is typically more valuable, other factors such as location and supply and demand play a significant role. Subbituminous: Generally used for electricity generation, subbituminous coal contains 35% to 45% carbon. A major component of U.S. coal production, subbituminous coal makes up 47% of U.S. coal production by weight and 41% by energy intensity. 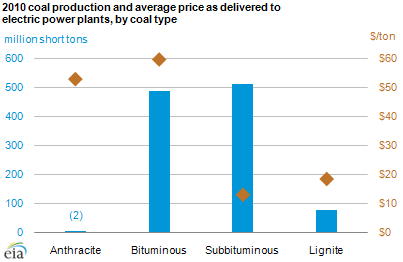 Although subbituminous coal has the second lowest energy content, large quantities are found in thick beds near the surface, resulting in low mining cost and, correspondingly, lower prices. Wyoming produces the vast majority of subbituminous coal in the U.S. Source: U.S. Energy Information Administration based on the EIA 7A Survey, preliminary 2010 data.